Our private pension is 50m away from the natural beach (where parasols are), and in a very quite position perfect for rest, where you can relax and regain power. When you are on holiday you do not seek only relaxation, you must take a tour to our beautiful island. We will gladly make you acquainted with a car or a scooter from the rental company. Let yourself be bewitched by the blue lagoon, which we will gladly arrange for you with a tour by the boat from the mainland to the islands of Paxi and Antipaxi. Pension Egrypos consists of double rooms and holiday apartments. All the rooms are equipped with all the necessities, easy arranged and all have very nice view to the sea. All the rooms have fridge, shower/WC and balcony. The holiday apartments are capacious and comprise of a bedroom, a parlour (extractable couches for children) separate cuisine, shower/WC, and terrace. The rooms are equipped with air-condition facility and are daily cleaned. We place a great importance on the personal and familiar contacts with our visitors, and we are gladly very helpful. If you still have any queries, we will be glad to answer them; moreover we exist in the guide books “Dumont” and “Marco Polo”, where you can easily find us. 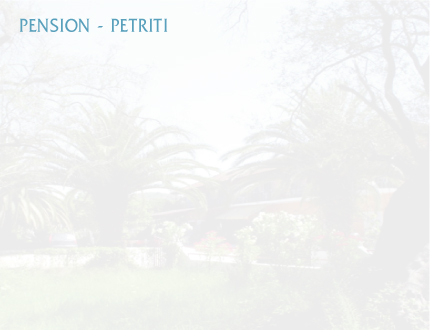 We hope that your interest for Petriti is arisen and that you will gladly greet Egrypos.